This time blame is pointed to state security, Mubarak or his remaining actors. Although, this is a legitimate hypothesis and needs to be taken into account, there is still no evidence, not even a story describing what allegedly happened. The reason people think that SS or Mubarak may be responsible is the fear that he may be trying to use the dirty card of sectarianism to divide people. And to make the people worried the most about this revolution, Coptic Christians, react against it. As far as I understand they are worried that the Muslim majority population will rally around Muslim Brotherhood or other groups that endorses an Islamic ideology and force it upon them. Again, a very legitimate concern that worries me too. In the past few weeks Egyptians of different faiths have displayed unbelievable shows of sympathy towards each other. 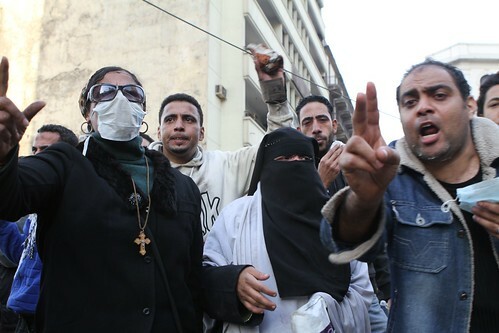 Muslims showing support outside churches during Christmas and Christians protecting praying Muslims in Tahrir square. Both were one against terror and tyranny. Violent acts like these invoke powerful emotions. And I'm certain that both terrorism and tyranny are powerless in front of a nation standing firm and united. Although, often this unity is blown out of proportions by the media. And is used to gloss over a real and important social divide between Copts and Muslims, that isn't necessarily always violent. We need to cross this stage and start to move a step forward. We need before accusing anyone in a knee jerk reaction realise that we are past the idea of being fragile. The entire vicious police force was brought to its knees in one day and the paramilitary thugs of Mubarak and his cronies where crushed after a 26 hours battle. We need to eliminate the fear that one day sectarian violence will escalate to the extent of a genocide or civil war. It won't happen. What we should be doing now is demand a high standard investigation of those two incidents. We need evidence. The forensic doctors who buried the truth with Khaled Said with shoddy reports should be removed. We should no longer allow the police to round up random suspects and torture them to confess a crime they never did. We shouldn't accept a prosecution that doesn't really care about what it is investigating, lacks independence and transparency. The bombers of the Alexandrian church are still unknown. There is a complaint that allegedly former minister of interior is behind it. A serious allegation but I haven't seen or heard of convincing evidence. People already are believing this and building on it further theories. Not defending anyone. Mubarak has blood on his hands for what happened in his gulag over 30 years and the past few weeks since Jan 25. But we need evidence because if the perpetrator isn't Mubarak or his state security then we are in trouble and who ever did this will get away with his crime while we are busy calling for uniting a country that is already united, specially in time of crises. Reason should be integral to the spirit of this revolution. Truth and our heads shouldn't be buried again.